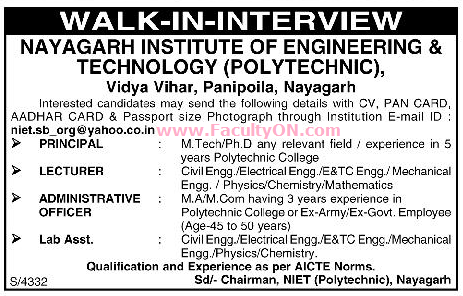 Nayagarh Institute of Engineering and Technology, Nayagarh has advertised in the SAMAJA newspaper for the recruitment of Teaching Faculty- Lecturers / Principal Plus Non-Faculty jobs vacancies. Interested and eligible job aspirants are requested to apply immediately from 13th August 2018. Check out further more details below. College Profile: One of the leading Institute of Nayagarh, Promoted by "Vidya Aloka Charitable Trust" Dedicated to empower the state of Odisha in the field of Technical Education.